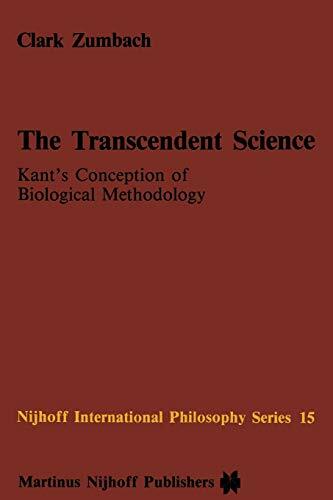 The most neglected sector of Kant's Critical Philosophy is his collec­ tion of remarks about biological phenomena in the second part of the Critique of Judgment, the Critique of Teleological Judgment. The reasons for this are numerous, but since in Kant, everything comes in threes, a three-fold collection will suffice. The Critique of Teleological Judgment itself is one reason. More than most of his writings, this segment of the Critical corpus suffers from what can most charitably be termed "mistakes of exposition. " In this part of the third Critique, it is commonplace to find sub-arguments in Kant's general position somewhere other than their logical niche. The result is that the general theme behind his remarks about living phenomena is obscured. This difficulty has done much to discourage even the most enthusiastic of Kant admirers from investing their time on this work. Secondly, in this century, until very recently, there has been little interest in philosophical questions about biology. Twenty-one out of thirty-one sections of the Critique of Teleological Judgment (sections #61 and 63-83) deal either directly or indirectly with issues of interest in the philosophy of biology. Finally, the Critique of Teleological Judgment has been placed among the last on that list "of writings thought to formulate Kant's Critical system. This is not merely because of its temporal position.